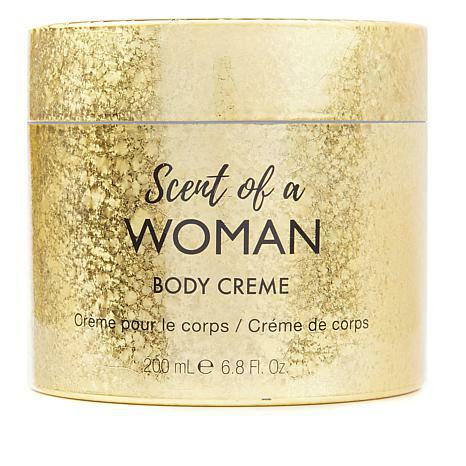 Rich, luxurious body cream infused with Scent of a Woman fragrance. Ingredients: Aqua/Water/Eau, Butyrospermum Parkii (Shea) Butter, Myristyl Myristate, C12-15 Alkyl Benzoate, Glycerin, Hydrogenated Polyisobutene, Stearic Acid, Dimethicone, Cetearyl Alcohol, Triethylhexanoin, Polysorbate 60, Sorbitan Stearate, Caprylyl Glycol, Hydrolyzed Jojoba Esters, Myristyl Laurate, Zingiber Cassumunar Root Oil, Ceteareth-20, Carbomer, Sodium Hydroxide, Disodium EDTA, Phenoxyethanol, Fragrance (Parfum), Benzyl Salicylate, Butylphenyl Methylpropional, Citronellol, Coumarin, Geraniol, Hexyl Cinnamal, Hydroxycitronellal, Limonene, Linalool. I love it! The fragrance is addictive and the body cream leaves my skin feeling very soft and smelling oh so good! Men and women stop me and ask me what Im wearing. Try it, you wont regret it!